Today’s programme presents four solo keyboard sonatas by two of the giants of the classical era, Haydn and Mozart, played on fortepiano – the precursor of the modern piano. The piano played in today’s recital is by Paul McNulty (1987), a copy of a 5-octave Viennese instrument by Gabriel Anton Walter (1795). Both Haydn and Mozart owned pianos made by Walter very similar to this instrument. Its light action and clear, transparent sound differ profoundly from the modern piano and reveal the music in ways that bring us much closer to the musical language of the composers’ day. Influential upon both composers were two members of the Bach family: Johann Sebastian, and Carl Phillip Emmanuel. Both Haydn and Mozart were close acquaintances of a remarkable patron of music, Baron Gottfried van Swieten, who maintained an important musical salon in Vienna towards the end of the 18th century at which fugues by the elder Bach were frequently played, among them works from The Art of Fugue and the 48 Preludes and Fugues (which van Swieten even loaned to Mozart to copy out). Examples from both these works will be played in between the pairs of sonatas this evening. Carl Phillip Emmanuel Bach was one of the most renowned keyboard performers of the 18th century, whose treatise on keyboard playing and Sonatas with Varied Reprises (published in Vienna in 1767) Haydn knew intimately. Bach’s striking keyboard writing, which traverses the entire range of the instrument, exploiting a variety of colouristic effects, strongly contrasting rhetorical gestures, intricate embellishments and provocative silences, soon became profoundly embedded in Haydn’s own sonatas. All those kinds of effects are clear to hear in the A flat Sonata, Hob.XVI:46 (1768), especially in its slow movement in D flat major (a very rare key in Haydn’s day), which moves through striking harmonic twists and turns. Its first movement is exceptionally broad, introducing many contrasting ideas and running across the whole of the keyboard range. It is one of Haydn’s largest sonata movements, in fact. It is balanced at the end by a playful Presto, idiomatically written and belying Haydn’s own description of himself as a ‘tolerable’ keyboard player! The surviving autograph of Mozart’s C major Sonata, K.330 (c.1782) is today in the library of the Jagiellonian University in Kraków, Poland. A quite small oblong octavo volume, it gives us some insight into the workings of the composer’s mind with its finely profiled handwriting and keen attention to details of articulation. There is something reminiscent of Mozart’s operatic talent about the succession of gestures in the first movement – each one finely turned and carefully delineated by the composer’s careful application of phrasings and staccatos – that suggests his purpose was to demonstrate here his mastery of contrasting characteristic types, as if the fortepiano keyboard was now serving him as a small and very portable theatrical stage across whose keys a succession of dramatic personae flitted. It’s quite easy to imagine the composer explaining to one of his young Viennese lady pupils how to capture those characters in the phrasing, balance and dynamics, now charming, now confident, shy, coquettish and lyrical by turn (Mozart even manages to bring in a brief military reference at the end of the exposition and recapitulation, the rising dotted fanfare reprised with a rousing flourish each time). To cap it all, the right hand part is written in the soprano (not treble) clef, a sure sign of pedagogical intent. Mozart must surely have used this piece in his teaching. The expressive middle movement provides obvious opportunities for embellishment in its frequent repeated sections. Interestingly, when Mozart published the work a few years later, he added a coda not present in his autograph, returning to the cadence of the darker, introspective central section but transposed to the major key – something we recognise with the benefit of hindsight as almost Schubertian in effect, and providing a smoother transition into the sparkling rondo finale. The B flat Sonata, K.570 (1789) was for many years thought to be a violin sonata, and was normally excluded from the various editions of Mozart’s piano works. This was despite Mozart’s own handwritten Thematic Catalogue including clear reference to it as a ‘Sonata for Piano alone’. Even though its first movement is in a clear sonata form, the frequency with which its main theme recurs within the main sections hints at an alternating episodic structure, rather than the unfolding narrative typically found (especially if sonata form is viewed from a 19th-century perspective). This episodic tendency is continued more explicitly in the other two movements: the first episode in the central Adagio borrows quite closely from the finale of the C minor Piano Concerto, K.491, completed three years earlier; the finale is very much in the manner of the contemporary Harmoniemusik for wind band, and bears more than a passing resemblance to the character of Mozart’s wind serenades, most especially the finale of the Gran Partita in B flat, K.361. Recently described as ‘One of the foremost exponents of the period piano in the UK’, John Irving is an established performer on early keyboards (notably fortepiano, harpsichord and clavichord), specializing in music of the later 18th century. International Piano has described his Beethoven playing as ‘Excellent…played with historical awareness and humour’. John’s performances on fortepiano challenge traditional expectations of the piano repertoire of Haydn, Mozart and Beethoven, going beyond the notated texts into an improvisatory mode of creative engagement with the score that recaptures performance expectations in the 18th century. By turns virtuosic and extemporary, his performances are noted for their accessible engagement with audiences, offering fresh insights into this repertoire. 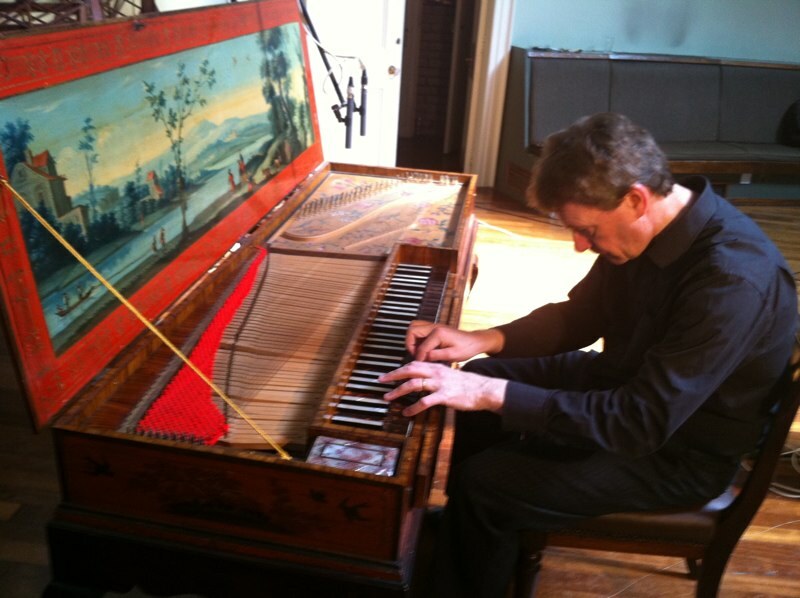 John plays a 1988 Paul McNulty fortepiano: a copy of a 1795 Viennese original by Anton Walter. He has also performed and recorded on historical originals, including Rossini’s piano in Pesaro. His most recent solo CDs are Josef Haydn Piano Sonatas (Devine Music, 2015) and John Irving Plays Mozart on the Hass Clavichord (sfzmusic, 2013). His chamber music disc, Beethoven and the art of Arrangement with Ensemble DeNOTE (Omnibus Classics, 2015) won a 5* review in Early Music Review. Recent and forthcoming appearances include King’s Place; Milton Court, Barbican Centre; Greenwich International Early Music Festival; LSO St. Lukes; Brighton Early Music Festival; North York Moors Chamber Music Festival; St Cecilia’s Hall, Edinburgh; the Holywell Music Room, Oxford; Royal Irish Academy of Music, Dublin; Conservatorio della Svizzera Italiana, Lugano; ORPHEUS Instituut, Gent; Fondazione Cini, Venice; the Geelvinck Festival, Amsterdam and the Valletta International Baroque Festival. John is Professor of Performance Practice at Trinity Laban Conservatoire of Music and Dance, London. Previously he was Professor of Music at Bristol University and subsequently Director of The Institute of Musical Research at London University and Vice President of the Royal Musical Association. An internationally recognized Mozart scholar, he has published six books on Mozart, including an international best-selling biography, The Treasures of Mozart (André Deutsch, 2010) and contributions to the internationally-acclaimed The Mozart Project (a digital book for iPad). In 2016 John was appointed Honorary President of University College London’s Chamber Concerts Society.